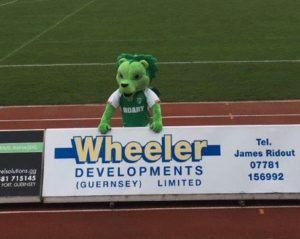 When Guernsey FC was formed in 2011 to offer the island’s elite players a new avenue for competitive football the reaction from the islands community was fantastic, thousands of supporters signing up for season tickets and coming along to each and every home game to support the team. For many people the excitement of a game of football comes in the form of lots of goals, a fair amount of cheering and possibly even an after match tipple or two to replace the warmth lost during two hours of sitting outside in the middle of winter.. But for those others who are involved in the organisation and running of each and every match the level of commitment is far more than a couple of hours per week.. As a result the average home game at Footes Lane takes far more effort than just the 11 or 12 players who actually get to put a foot on the ball when the whistle blows. For Wheeler Developments, it has been an absolute pleasure to have been part of this behind the scenes journey from the very start, with countless occasions where either the project management skills of our management team or the horsepower of our plant machinery has been utilised for pre and post match activities. Being able to work with such a fantastic organisation as Guernsey FC in promoting the team as well as the Island itself has, on occasion, taxed our brain cells and time management but it is all made worthwhile when the final whistle blows and Guernsey FC come back to the dressing room with another win under their belt. We’d be lion if we didn’t admit to having a soft spot for Roary too!